A survival radio is an important tool to keep you and your family safe during emergency situations, however, it can also be used for entertainment in normal times. If you are looking to prepare yourself and want to buy the best survival radio you've come to the right place, because we have done all the research and created a list of the best survival radios on the market today. It's always a good idea to do a bit of research before you go out and buy a survival radio for yourself. Besides warnings and alerts you want a survival radio that also has some extra features that can help you survive an emergency situation. Keep on reading and use our buying guide to find the best survival radio for your own needs! 3.1 Which Radio Is Best For You? 3.2 What Do You Want To Receive On The Radio? If disaster strikes and you find yourself stuck in your home without any information about what is happening, a good survival radio can be quite useful and can actually save your life. Most survival radio models are equipped with a host of features to help you get through an emergency. If you are searching for a high-quality survival radio, read on since this article will be discussing the features of some of the best survival radios available in the survival radio reviews below. 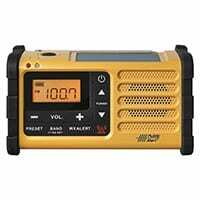 The KA500 is a great choice if you desire a high-quality radio that’s just perfect for emergencies. It includes a solar panel and AC generator, which means that you never have to worry about the batteries going dead. The LED lamp is one of the standout features of the radio. If you are dealing with low light conditions, the radio can be used to light the way. On the side of the radio is a LED light that can be used to signal in case of an emergency. The KA500 is equally a great option if you experience a power outage. It can be used to charge several different electronic devices. The weather alert feature is great to have when you are dealing with a natural disaster. The Kaito KA500 survival radio is designed for stable reception, which means that it can be literally a lifesaver if it is available. The Sangean MMR-88 is another great choice when it comes to survival radios. It comes with a charger for your phone and the LED flashlight can even be used to give Morse code signals. You have the option to charge the radio through hand cranking, but you can also plug it into your USB port if there’s no power or you can use the solar panel. If you choose the Sangean MMR-88, you never have to worry about dead batteries. The Sangean MMR-88 provides access to radio programs, news, music, and even weather alerts and warnings. It is the perfect solution if you are stuck inside your home after a natural disaster or a weather event. One thing that you are guaranteed to appreciate about this survival radio is the fact that it includes a flashlight and emergency buzzer. It is a versatile but an extremely easy-to-use unit. It would not be right to have a list of the best survival radios without the inclusion of the Midland ER310. Whether you choose to use the radio on a daily basis or only during severe weather events, it will always be ready for use since it has many different charging options. The Midland ER310 is a NOAA receiver with 7 channels, which means that you can listen to weather alerts, news, or messages on any of the channels in case of an emergency. If an alert has been issued to warn people of impending danger, the ER310 will notify you using a loud siren. The Midland ER310 allows you to enjoy a variety of radio stations and you can even share the music with others. You can connect headphones if you would like to listen to the radio privately. The ER310 comes with a rechargeable Lithium-ion battery. When fully charged, it can last for more than 30 hours and it can be recharged by using solar power, hand cranking, or plugging it in using a USB cable. If you are searching for an option that will keep you and your family safe when disaster strikes, the Midland ER310 survival radio is an excellent one. The KA600 from Kaito is the ideal survival radio that’s set apart by 2 unique features: Radio Data System (RDS) that allows listeners to enjoy conventional FM radio broadcasts and the ability to enter a frequency by use of a direct keypad entry. The Kaito Voyager Pro KA600 has the 7 main weather channels from NOAA that provide reliable information about the kind of weather expected in different parts of the world when you are planning to travel or during a disaster. Entertainment channels are also available and they feature breaking news, sports, and talk shows. You will be sufficiently covered irrespective of where you live. 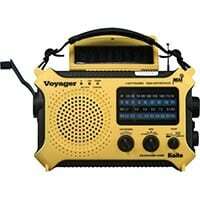 The FM reception is excellent and you can rest assured that this emergency radio is dependable. It boasts of features such as a digital thermometer, solid battery life, and a humidity meter, which makes the Kaito Voyager Pro KA600 one of a kind. It is the ideal companion in case of a power outage or when you are camping out since it has lights that allow you to see in the dark. The FRX3 from the American Red Cross is a multi-functional survival radio that can charge your smartphone and other electronic devices, alert you about the weather, and do so much more. The radio helps you prepare beforehand for unforeseen natural disasters and even other emergencies thanks to the weather alert feature. 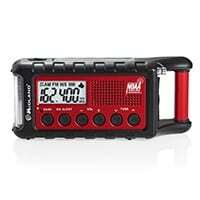 The radio can be charge using the hand crank, using a set of NiMH batteries, or with solar power. Once it is fully charged, the American Red Cross FRX3 offers consistent, continuous performance for up to 4 hours. 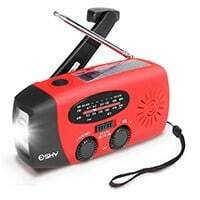 The dual-function LED flashlight is another notable feature of the American Red Cross FRX3 radio. If you press a button found at the radio’s upper corner once you will get a bright light, but if you press it again, the LED light will start blinking. The American Red Cross FRX3 survival radio even comes equipped with a headphone output and AUX audio port. You can recharge the radio’s batteries as well as other devices such as a smartphone using the USB charging port. If you are searching for a multipurpose survival radio that comes with plenty of beneficial features at a great price, then the American Red Cross FRX3 is an excellent option. In as much as a survival radio is a valuable investment, it is wise to put all the cards on the table and weigh your options before you run your credit card. Know the specifications of the radio to ensure you are confident of why you need the device. Also, do your homework to know all you can about the different survival radios in the market. Research and get familiar with the various features that come with the radio and the usefulness of the gadget in the event of an emergency. Be informed. Below is some helpful information that will guide you on what to consider so that you make a wise choice when buying a survival radio. Which Radio Is Best For You? The market has different survival radios, and each has a specific design yet all function almost the same way, they are devices that provide a one-way communication to alert you. The radios do not have the capacity to communicate with other types of radios; they are radio receivers. A different kind of radio that is slightly more expensive is what you need you need if you want to contact the relevant authorities after you receive the alert. Any radio can work if you only want to receive information of the activities outside and you are trapped inside in the event of a crisis. What Do You Want To Receive On The Radio? You should take into consideration the reception ability of the survival radio before buying the device. A survival radio with an independent and excellent reception is a fantastic buy, but you should as well think of using a separate antenna as a means of boosting the reception of the radio. Also check if the survival radio has a NOAA logo. The logo indicates that you are buying a device that can receive warnings and news from the National Oceanic and Atmospheric Administration. Such a radio will still get emergency alerts even if you do not have a good reception during severe weather conditions or natural disasters. The power options will depend on the type of radio you buy. You get more options such as battery charging if you buy the expensive radios that have a higher quality. Battery life is an essential factor to bear in mind, and this means considering alternative means of charging the device if one power option is unavailable. A survival radio with an AC adapter will work for day-to-day use to ensure the device stays charged. But what do you do when power is unavailable? 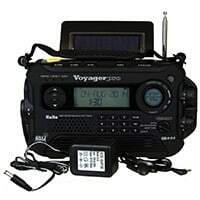 Some types of survival radios have a solar panel or a hand crank you can use to charge the radio. With the alternative charging options, you will be able to get emergency alerts even if you lack the main means of charging the gadget. The best survival radios to consider buying are those that have solar charging panels and extra rechargeable batteries. Life and death situation may be an unexpected emergency and having the alternative power options for the radio will help during such incidents. The above information covers the essential features worth a top-consideration when buying a survival radio. This section mentions some other notable features worth considering. Water and dust resistance is yet another handy feature worth considering when buying a survival radio. Other notable additions include LED lights and alarm clocks. 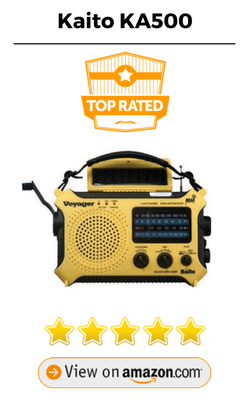 Such a radio is an excellent purchase if you are in an area prone to heavy rain and the dust resistance if you are in a dusty place with frequent winds. LED lights can work as a secondary light source during emergencies and can also be used as an emergency signal. Most radios may even have a Morse Code flashlight which can be a handy addition if you consider certain emergencies that may have you stranded and lacking suitable escape options. Some survival radios come with specific charging ports that can be used to power up other electronic gadgets such as phones. It would be nice to have a radio that can charge your phone when it dies, and you are within cell-range meaning you can use the phone to call for help. Other additional features you may find in some survival radios include USB ports, an FM receiver, and stereo headphones port. Given the many things to consider when purchasing a survival radio, choosing the right device may prove to be overwhelming. Hopefully, the above information gives you some insights on that you should look for to make the right choice. Pick the right survival radio, and it will be something that serves you during a crisis as well as on a day-to-day basis. Get familiar with the various features and make a comparison of their usefulness based on different situations. The right radio will be a tool you can rely on to survive a catastrophe and can also serve as a source or entertainment when traveling. So take your time and consider all the options when looking to purchase the best survival radio for your own needs!